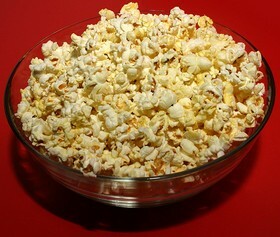 While popcorn is clearly viewed as a healthy snack, many people choose flavored popcorn over plain popcorn. These days, many food manufacturers have brought us popcorn that we can microwave in bags. Unfortunately, microwave popcorn is typically loaded with salt and butter, not to mention preservatives. This obviously reduces the number of health benefits associated with eating popcorn. You may want to avoid eating flavored popcorn on a regular basis, since eating too much of it is simply a health disaster waiting to happen. But if you can’t eat popcorn out of the bag with all the goodies, how can you eat it? After all, plain popcorn is bland and salt just falls off popcorn by itself. So, how can you flavor it so it’s still healthy? 1. Jazz up plain popcorn with flavored cooking spray — there are a variety of flavors such as butter, olive oil, and even garlic to name a few and these won’t cause your waistline to expand. 2. Add some cinnamon to popped popcorn — mix it up well. If you’re worried about the cinnamon not staying on the popcorn you can spray it with a little cooking spray first just to hold it on, butter is probably the better flavor for this. 3. Add red pepper to your popcorn — you can spray the popcorn with a bit of cooking spray to help the seasoning stay on. 4. Saute some garlic in olive oil and then add it to your popcorn — consider adding some grated Parmesan cheese and a bit of salt and pepper. 5. Season popcorn with taco seasoning — you’ll need a bit of cooking spray to help it stick to the popcorn. 6. Add some hot sauce or soy sauce — while they may make your popcorn a tad gooey, these can be a good substitute for salt and butter. With the discovery last year of a man getting lung cancer from consuming too many bags of butter-flavored microwave popcorn, I don’t know about you, but my desire to find alternatives to the microwave stuff went way up! 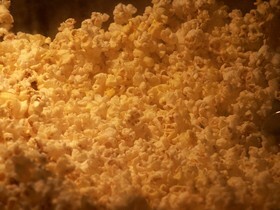 While his doctor said his lung cancer was caused by eating several bags of buttery microwave popcorn a day, it has also been revealed that workers in the plants that make the butter-flavored microwave popcorn are also getting lung cancer from breathing in the same chemical (diacetyl) that caused that man to get lung cancer. Just knowing that this chemical exists in butter-flavored microwave popcorn is enough to keep me very far from it. Who wants to take the risk? Certainly not me. The recipes and seasonings listed above will enable you to reap the many health benefits of popcorn without having to worry about all the chemicals, fat and calories that are added to the microwave stuff.